Hindu mythology tells a story about how Lord Ganesh won a race without the benefit of speed. He and his brother Kartikeya agreed to race to see who could go around the world 3 times and come back first. Kartikeya set out right away flying off swiftly on his trusty peacock, the vehicle he used for getting around the universe. He was quite sure that his little brother Ganesh didn’t have a chance of beating him. After all, Ganesh’s vehicle was a small mouse named Mushika. Ganesh considered the task at hand thoughtfully, and then he got onto Mushika and rode him slowly, with devotion, three times around his parents, Shiva and Parvati. When his parents asked what he was doing, he replied that they (Shiva and Parvati) were the whole world and so Ganesh didn’t need to go any further in order to circle the world. When Kartikeya returned on his peacock, he couldn’t help but admire his little brother’s ingenuity. It is a lovely story. It is a story about many things, including patience, ingenuity, and discovering more than one way to “win” a race. It reminds us that going slowly can create the mental space necessary to actually remember what’s important and then do it; that slowing down is an important bridge to remembering Shiva, which is also our True Nature. This is so necessary in parenting and spiritual practice – to slow down, to remember, to make your next move from a place of inner awareness. It’s hard to slow down, though. There is after all a lot to do, and someone has to do it. And there is the fear that if we slow down, we might lose something – our edge, the race, our peace of mind. It is truly hard work to pause and delay the drive towards doing. It is hard to resist the urge to react. We rush ourselves. We hurry our children. We push. We may not even realize we are doing it. We feel pressure to be on time. We feel pressure to keep up. We feel pressure to meet others expectations. So much pressure. And, while it is important to be on time and to follow through with commitments to others, it’s rarely as urgent as it feels. What if we were to resist the pressure? What are the rewards to slowing down the pace? As a mother, just remembering to pause and breathe can turn a stressful moment around, making joy, connection and even cooperation more likely. Slowing down gives the mental space to think, “what is the next right thing to do?” This can create a nicer flow and richer results than rushing from task to task hurriedly or unconsciously. Sometimes slowing down actually helps you get to where you need to go “on time,” because relaxed children are more cooperative than stressed, rushed children. Same goes for adults. Regular meditation practice can help with learning how and when to slow down. It gives us a structure and tools to practice slowing down and taking time to check in deeply with ourselves. In meditation, we become acquainted with our breath and its power to change our mental state. Over time we start to notice our patterns – the ways we rush ourselves or avoid our feelings, or lose our way. We create more opportunities to respond rather than react. We develop new patterns of patience, acceptance, attentiveness and surrender. If you’re longing for the benefits of slowing down long enough to tune in to your own heart and mind, join us at Austin Big Heart Yoga for meditation, hatha yoga, and special parenting events this spring! Hatha yoga every Thursday at 6:30 p.m. Meditation for Mothers series begins February 3, 10:45 a.m. When I attended a yoga teacher training at Shoshoni Yoga Retreat in 2001, I couldn’t quite understand all the focus on breathing. While I did find it helpful to breathe more deeply, and pay more attention to my breath, I wondered about the necessity of repeating this instruction over and over. I was mildly suspicious of the promise of spectacular results that could come from a simple breath. At the same time, I was very curious about how my lovely teachers had become such happy and generous people. They seemed to transmit a remarkable sense of inner ease and contentment. So, I took what I had learned, along with my doubt, and I practiced. After thirteen years and countless conscious breaths, I am beginning to see the point a little more clearly. Great yogis have said that if you want to change the mind you change the breath. It’s really that simple. At this point in my practice, I have indeed found my breath to be a refuge, an anchor, a bridge to bliss, a way out of chaos, and a reminder of my oneness with others and the world. It is a means to soothe my child, a means to soothe myself, and a powerful tool for releasing mental and emotional tensions of all kinds. 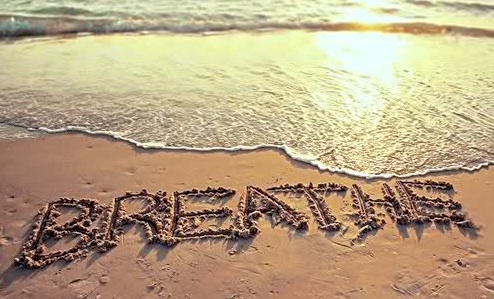 My breath can be a bridge to gratitude, love, kindness, forgiveness, openness, connection, and healing. It lives in the relationship between me and my children – in the quiet moments, the belly laughs, the tender touches, the holding of space while another cries and cries. 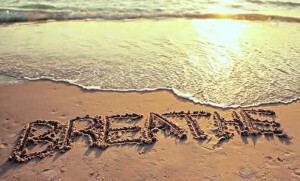 My breath can soothe or energize me, and it can at times help me to bear what needs to be borne. It can transform anger into a force for good. It can bring me into the present moment, ready to open to whatever is coming my way. All of that and more. So now I remind students often to pay attention to their breath, and I enjoy speaking of the possibility of spectacular results! Monday, September 1 at 1:00 p.m. Hatha yoga, chanting, and meditation with Anita. Austin Free Day of Yoga. Beginning September 16, Tuesdays at 9:30 a.m. or 10:45 a.m. Meditation for Mothers with Anita. Beginning September 10. Wednesdays at 9:30 a.m. Hatha Yoga and Meditation with Jana. Beginning September 12. Fridays at 9:30 a.m. Hatha Yoga and Meditation with Jana. Beginning September 12. Fridays at 11:00 a.m. Guru Gita practice with Jana. How does a yogi mom raise a spiritual child? Does she raise her child vegan, does she let him run wild? Does she give her child malas instead of rattles and toys? Does she shield him from plastic and non-yogic boys? Does she make him play yoga instead of video games? Does she spend her time calling “non-yogis” mean names? A yogi mom doesn’t. She practices peace. She sits every day and cultivates ease. She yells and she hugs; she does well and she sins; and always comes back to her cushion again. A yogi mom breathes deeply each day of the year. She becomes her best self, choosing love over fear. She models compassion with herself and her kin. She keeps trying and trying all over again. A yogi mom opens to life as it is, and by doing so…she hopes to raise spiritual kids. THE NEXT MEDITATION FOR MOTHERS SERIES BEGINS APRIL 15. Take some time for yourself, and join this supportive and inspiring series designed just for moms. We’ll explore the theme “Learning to Let Go More Deeply” with grounding hatha yoga sequences, pranayama practices, meditation, deep relaxation, and conversation. Tuesdays at 10:45 a.m. If you’d love to take the class, but it doesn’t fit your schedule, call us. Anita can design custom classes for private groups of 6+ mamas. Parents feel, and there is some reality to it, that they need to be in constant motion to keep their family’s needs in balance. The never ending cycle of cooking, dishes, laundry, shuttling here and there, work, buying groceries, and managing things in general can seem overwhelming – and then there’s all the FEELINGS that parenting can bring up in us. Anticipating needs, rushing to the next thing, and feeling over scheduled and overwhelmed are common experiences in today’s world. One thing that meditation has taught me is that when I slow down the pace internally, my whole attitude has an opportunity to shift. Sure, there are still piles of laundry, stacks of dishes, a path of toddler destruction, and Texas size roaches to be handled; but all of this seems more manageable (and/or less urgent) when I’m able to slow down my breath, notice my state, and connect to an inner sense of ease and sweetness. Sometimes slowing down means making different choices (like limiting obligations and prioritizing self care and family time). Regardless, there will always be days, weeks, or life phases that are necessarily busy and full. At these times, it creates more stress to try and resist what’s happening. Learning to “slow down” in the midst of such busy/full times is an even more refined skill in my experience. The yogic practices of being fully present, conscious breathing, mantra, meditation and practicing within community (sangha) are powerful tools for learning to slow down despite the speed of your life, kids, thoughts, or household critters. In our upcoming “Meditation for Mothers: Deepening your Practice Series,” we’ll be exploring some important questions together. During the stressful times, how does one prevent becoming even more stressed? How can you find the sweet moments with your kids in the middle of the life you currently have? How do you come back to your own spiritual center, and open to your life more and more from that place? How can we integrate practice more and more into life as it already is? How do we release the worries that come with parenting? Flow down and down in always widening rings of being. Try this simple exercise. Upon waking (whether from an alarm, crying baby, barking dog, or because your body is rested and ready to rise), take 3-10 slow conscious breaths (it’s ok to do this en route to the crying baby, btw. Let’s keep it real). You can do this lying down or sitting on the edge of your bed. Notice how you feel – body sensations and breath quality. Feel inside for the “flavor” of ease, however big or small it may be. Now, try to take this quality of ease (felt in your body and breath) into the next few minutes of the day – whatever they are. It’s helpful to stay connected to your breath and simply focus on what you’re doing, like walking, making lunches, holding the baby, etc. (rather than being in the future or past.) You might want to put a little sign next to your bed to remind you of your intention (3 BREATHS) to help bring the experience of slow motion into the start of your day. Hope to see some of the Austin area mamas in one of the upcoming Meditation for Mothers series! Learning to open to the life that you have is one of the most beautiful gifts of a regular meditation practice. Disappointed that your relationship is not what it used to be? That your sweet-natured child is learning to speak up, but only with you, and only in regards to saying no to EVERYTHING you ask him to do? That your body looks or feels different than it did 1 or 20 years ago? If you can take a breath and truly let the disappointment go; if you can resist your urge to “make things as they used to be,” you may discover that there is joy in what remains. First, there is the “space” that comes when we really and truly surrender – perhaps a moment of spaciousness and inner ease, a softening. It is not necessarily easy to do, and you do have to REALLY want it. You have to mean it. You have to commit to taking that breath instead of feeding your negative thoughts. Then, there is the result of letting go. We become more present. When we focus on what IS, sometimes we are surprised at the beauty of the present moment. Perhaps you have less time with your spouse, but your ability to be truly comforting to each other in hard times has amplified over the years. Notice that. Perhaps your child seems less easygoing because she is becoming more confident in herself. As a result, her social relationships are blossoming and she hardly ever whines any more. Notice that. Perhaps your body can feel strong and steady with less exercise than you once needed in your 20’s. Perhaps you are learning that you are actually much, much more than your body. Notice That. If you don’t feel much like your old self anymore, try saying goodbye to your old self, and being open to who you are today. The other morning while I was walking on the greenbelt, I experienced a moment of being truly absorbed in the act of walking. Inside of me, everything became profoundly quiet, while around me the birds sang and the frogs croaked. For me, it is rare to experience this deep quiet in the midst of activity. This is part of what I love about walking meditation – how it prepares us to bring the experiences of meditation into the activity of our lives. Early summer mornings are a perfect time to practice walking meditation. We arrive just as the sun is rising. The sounds of nature are just barely awake. Birds, bull frogs, insects. 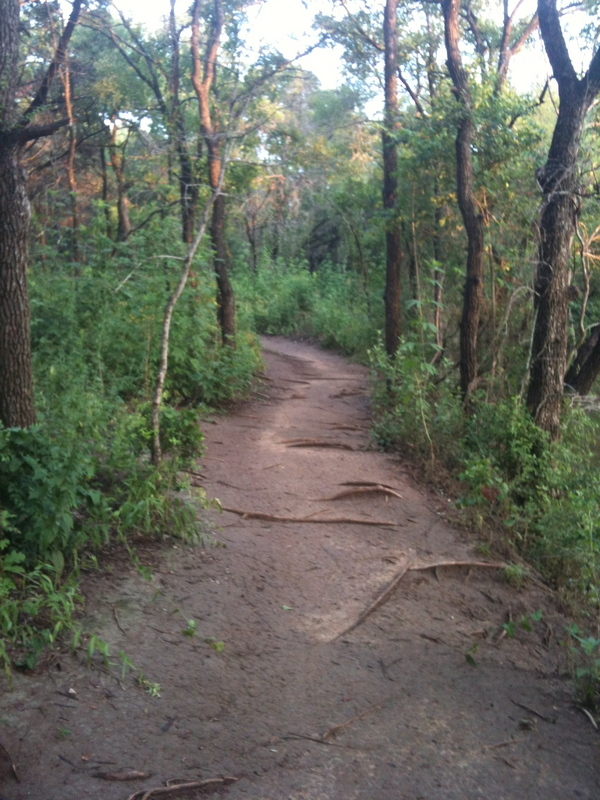 On these mornings, we are the first human feet to walk the path. The setting and the practice invite us to stay silent. To connect with the rhythm and feel of walking – just walking. To feel and observe the breath with more care than usual. To merge into the gap between the quiet night and the busy day. It is a gift to start the day moving silently in nature. Walking meditation is one of the many meditation practices that help us to cultivate presence and inner calm. Wouldn’t it be nice to move through more days feeling open, relaxed, and able to be responsive to whatever life brings? The yogis learned that it just takes practice. For most of us, this takes a lot of practice. But, just like with other skills, we can all improve with practice and patience. Join Anita 7/19, 8/9 or 8/16 for a meditation walk on the greenbelt. It’s free, and you’ll be so glad you made the effort! The other day, I treated myself to a large cup of convenience store coffee with hazelnut creamer. The flavor was both satisfying and familiar. This is not my normal fare. I am by and large a green tea drinker these days, with an occasional cappuccino splurge from the city’s best locally owned coffee shop. Today, however, something inside of me longed for convenience store coffee. The coffee sat in my car in an insulated cup while I took a hike with my dog. Somehow, when I returned to my car, the coffee’s flavor seemed even more satisfying and delicious. After a few generous sips, I felt a wave of remembrance of my mother, accompanied by a very sweet feeling of love and missing her. It was a moment where my whole body felt the memory – a memory of feeling safe and happy with my mom, who was nurturing, kind, supportive, and funny – a woman who loved to drink Folger’s coffee. When I was a child, I often walked with my mom over to our neighbors’ house, where she would visit with her friend and drink cup after cup of Folgers coffee. Sometimes, I got my own small serving of coffee, made especially delicious with a generous addition of milk and sugar. Today, almost 40 years later, the taste of the convenience store coffee tinged with the sweetness of hazelnut creamer, transported me into a state of loving remembrance. This remembrance became an opportunity to practice meditation. Through the teachings and practices of Shambhava Yoga, I have come to understand that the quality of love and sweetness evoked in me (by the coffee and remembering the best of my relationship with my mother), is actually coming from a place within me. It’s within me all the time. One of the centering practices of the Vijnana Bhairava states “On joyously seeing a long lost friend, permeate this joy.” Remembering my long lost friend, my mom, became an opening to connect with the inner joy and sweetness that is always there. And I did. I breathed gently into the sweetness, and watched it expand a little. Soon, the tinge of sadness associated with the memory of my mom (who is no longer here to share coffee dates) melted away, and the sweetness remained. Now, that is really something. This is just one of the gifts of meditation practice. If a cup of convenience store coffee can lead you to bliss, what else might be possible? I can’t wait to find out. I am reminded that my daughter is paying attention to everything. She is a sponge. Often at night, I will whisper “May you be happy and safe and may all beings everywhere be happy and free.” I love the ritual of blessing her and thinking of others. Tonight I grew impatient with her slowness at moving through the bedtime routine (aka intentional stalling to avoid bedtime when mommy is already extremely tired and increasingly grumpy). She said I was “being mean,” and she had a point. I thought about arguing with her some more (yes, sometimes I engage in arguments with my 5 year old). Instead, I took a breath, and I deeply let go of my mounting tension. It is a precious gift to have been taught how to do this. I felt my heart relax, and I settled into the next moment. We read a book. I tucked her in. She reminded me (as she often does) that it’s not fair that she has to sleep by herself. And then she said “you forgot to say May All Beings Be Happy and Free. Say it in the other language.” And so we said it again together, “Lokah Samastah Sukhino Bhavantu.” It was a very nice way to end the day. It is both amusing and frustrating that my daughter does not really like to do yoga with me. When she was a baby, before she had a say, we practiced “Itsy Bitsy Yoga” together. When she was about 2 years old, we went to a toddler yoga class. She spent the whole time wanting to nurse or running around. I tried to breathe and relax, knowing quite well that yoga was much more that a cute downward dog pose, but feeling disappointed just the same. We didn’t last long in the class. I took a breath and tried to let it go. At 2.5 I took her to Yoga kids’ camp. She cried a lot and barely participated. We didn’t finish the series. I took a breath, and tried to let it go. Even this past summer, at age 5, she did not seem to like yoga camp very much. On the other hand, since she was old enough to walk, she has been wandering into my meditation room as I do my practice. Before that, I practiced with her in my arms. Before that, in the womb. Not downward dog, but the simple practice of being present, saying mantras, letting go of everything except the present moment. If I could transmit anything to my daughter, it would be this: the practice of taking a breath and letting everything go and the courage to keep trying even when it doesn’t seem to be working. And the unending blessing of mantra. So, this is what I try to do when I am leading family yoga and she does not SEEM to be participating: I breathe and let go and do a little silent mantra. Sometimes I forget and get frustrated, but I can always try again. And I do keep trying. And sometimes through a simple breath or a silent mantra, I can let go and feel myself truly open to the beauty of accepting things just as they are. And this is the bliss of family yoga. Join me for Family Yoga on the 2nd Sunday of each month and for a Meditation for Mothers Series this fall. See details on the website. In one session, we practiced pulling our awareness inside, like a turtle pulling its head and legs inside of it’s shell, and practicing the “Om Namah Shivaya” mantra from this inner perspective. This is a powerful way to refocus, recharge, and strengthen one’s ability to stay centered in the midst of stress. The result is a feeling of spaciousness, lightness, and a stronger capacity to open up to whatever life brings next. Give it a try. Get quiet. Focus inside. Breathe “om namah shivaya” as you inhale and exhale. Repeat endlessly. Much gratitude and love to Babaji and all of the Shambhava teachers who taught this weekend!